The word 'gospel' means 'good news'. The good news that Jesus Christ has paved the way for EVERYONE (John 6:40) to enter or be admitted into His glorious and powerful kingdom (1 Corinthians 4:20). He is the way, the truth and the life, no-one comes to the Father except through Him (John 14:6). The Father has rescued us from the dominion of spiritual darkness and placed us into the kingdom of the Son whom He loves, the kingdom of light (Colossians 1:13), where our lives are now hidden with Christ in God until Jesus appears, (Colossians 3:3-4) and restores all things (Acts 3:20-21). (6) Good News That Makes A Difference! however is that for many of the early astronaut heroes, the right stuff included deep religious faith. Neil Armstrong and Buzz Aldrin are best known as the first astronauts to land on the moon and take that "Giant leap for mankind. But you probably don't know that before they emerged from the spaceship Aldrin pulled out a Bible, a silver chalice, and sacramental bread and wine. There on the moon his first act was to celebrate communion. Frank Borman was commander of the first space crew to travel beyond the earth's orbit. Looking down on the earth from 250,000 miles away, Borman radioed back a message quoting Genesis 1: "In the beginning, God created the Heavens and the earth." As he later explained, "I had an enormous feeling that there had to be a Power greater than any of us - that there was a God and that there was indeed a beginning." The late James Irwin who walked on the moon in 1971, later became an evangelical minister. He often described the lunar mission as a revelation. In his words, "I felt the power of God as I'd never felt it before." Charles Duke who followed Irwin to the moon later became active in missionary work. As he explained, "I make speeches about walking ON the moon and walking WITH the Son." Guy Gardner is a veteran astronaut who speaks in churches on the reality of God. What is it about being in space that seems to spark our innate religious sense? Two centuries ago the philosopher Immanuel Kant said there are two things that "fill the mind with ever new and increasing admiration and awe: the starry heavens above me and the moral law within me." Reflecting about these things Kant wrote "Lead our minds to contemplate God Himself - the moral law revealing His goodness, the heavens revealing His power." As the Psalmist put it: "The heavens declare the glory of God." Or as John Glenn put it as he observed the heavens and earth from the windows of Discovery: "To look out at this kind of creation and not believe in God is to me impossible. It just strengthens my faith." Our Sun is still very active. In the year 2000, our Sun went through Solar Maximum, the time in its 11-year cycle where the most sunspots and explosive activities occur. Sunspots, the Solar Cycle, and solar prominences are all caused by the Sun's changing magnetic field.Pictured above is a solar prominence that erupted in 2002 July, throwing electrons and ions out into the Solar System. The above image was taken in the ultraviolet light emitted by a specific type of ionized helium, a common element on the Sun. Particularly hot areas appear in white, while relatively cool areas appear in red. Our Sun should gradually quiet down until Solar Minimum occurs, and the Sun is most quiet. No one can precisely predict when Solar Minimum will occur, although some signs indicate that it has started already! Hubble snapped this panoramic view of a colorful assortment of 100,000 stars residing in the crowded core of a giant star cluster. 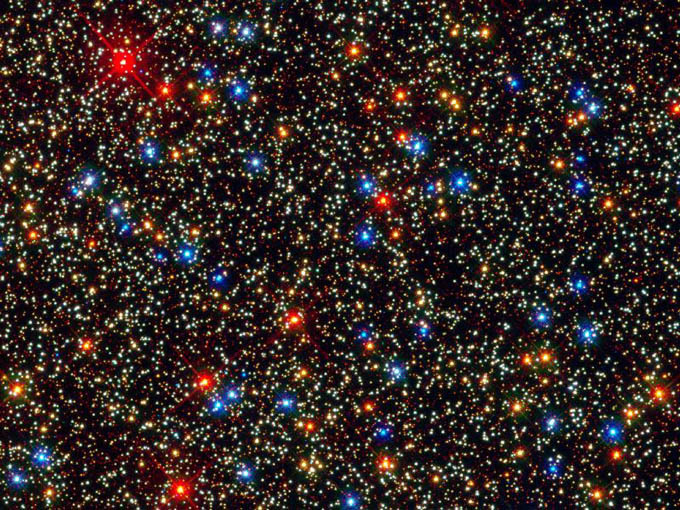 The image reveals a small region inside the massive globular cluster Omega Centauri, which boasts nearly 10 million stars. Globular clusters, ancient swarms of stars united by gravity, are the homesteaders of our Milky Way. The stars in Omega Centauri are between 10 billion and 12 billion years old. The cluster lies about 16,000 light-years from Earth. "I praise You because I am fearfully and wonderfully made; Your works are wonderful, I know that full well" (Psalm 139:14). Few of us appreciate how sophisticated our eyes are. They are more advanced than any camera; we can look in many directions in an instant. The focusing muscles of the eyes move around 100,000 times in a day: to give your leg muscles the same workout, you would need to walk 50 miles. Did you know that the average human blinks 6.2 million times a year, and your pupils expand as much as 45 per cent when you look at something nice? It's caused by a rush of the hormone adrenaline. The average ear can measure 40,000 different sounds - and it never stops working. Even when you're asleep, it continues to hear sounds, but the brain shuts most of them out so that you're not woken. Three tiny bones that come together to make a bridge in the middle of the ear, which is needed to detect sound vibrations, are the smallest in the body. At their largest, they are no more than 8mm in length - no bigger than a Smartie (small sweet). The shape of our outer ear is unique to the individual and does not change from your first birthday. All it does is grow proportionately - around a quarter of an inch every 30 years.